Yacht Club Games has just put out a new trailer showing off the playable Plague Knight character for their successful retro platformer Shovel Knight. In the update, which is free, you’ll not only get to play as the Plague Knight, but also experience a new story, mechanics, and remixed game content. According to the developer: “You play as Plague Knight, the villainous master of alchemy, in a quest all his own. 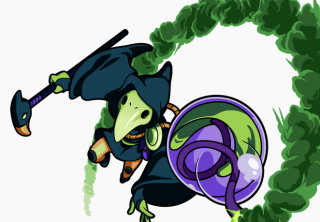 Using his maniacal scientific mind, Plague Knight is seeking to concoct Serum Supernus, the Ultimate Potion. However, to retrieve these ingredients, he must extract them from his former allies… the villainous knights of the Order of No Quarter!"